Two editors have popped up on the web which allow you to create your own Super Mario Bros. Wii levels, if you got the chops. On the day that Super Mario Bros. Wii was released here in the states, two different hackers released programs which allow the user to edit any level in the game, or to craft an original one. Tanooki, by Virus and Vash, was released first but Treeki claims he was working on his editor, Reggie!, for quite some time. The two different editors were released independently, but there does seem to be evidence that the two teams are considering working together to make one ultra-hacking tool for SMBW. Videos of their handiwork can be found here and here. 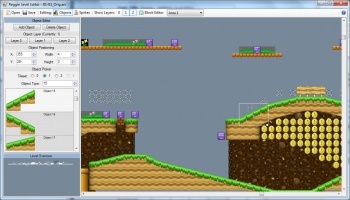 The editors work only on a PC, so you would need to emulate the Wii platform there in order to begin working on your own levels. Any levels you made or received from others would then have to be played on the emulator. Unless you had the ability to burn a disc that your Wii console could read. I'm not saying I know that such tools exist, but, if they did, (they do) using them in combination with these level editors might make for some interesting Wii levels surfacing on consoles around the world. Of course, this is all in a legal grey area. Tinkering with the game like this is most definitely against Nintendo's E.U.L.A. and T.O.S. As long as none of the hackers attempt to charge for using Nintendo's copyrights, however, then the cops most likely aren't going to come knocking on their door. That caveat lasts until some industrious hacker starts asking for Paypal donations in order to download his Super Mario Bros. Wii level in which Mario can jump through a group of coins which conspicuously looks like a part of the male anatomy. Then we've got problems.